Long-term readers of this blog know a little about my obsession with Santa. My grandkids call me Santa, for instance. 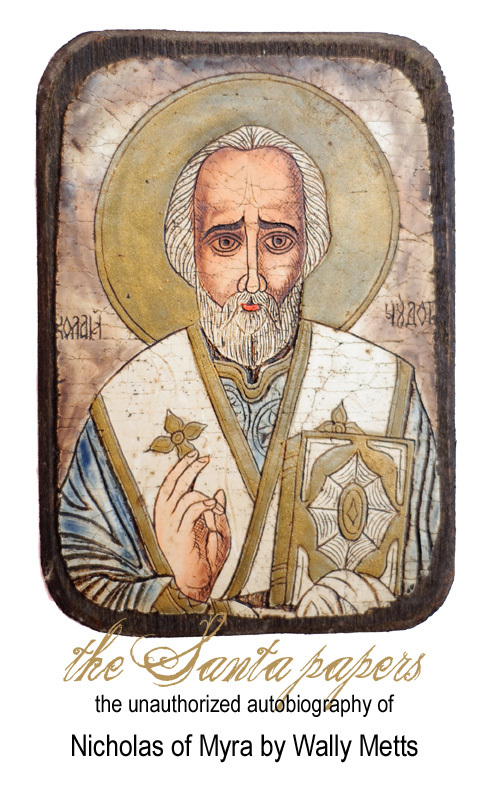 And I’ve written about why and how we celebrate St. Nicholas day. The Santa Papers is my effort to tell his story. It’s historical fiction, based on research I did while I was on sabbatical a couple of year ago. In this “unauthorized autobiography” Nicholas tell how he became Santa. And how he feels about that. It’s a short, easy read—only 40 pages, and you can read the whole thing out loud in an evening. It is also interesting and fun. The book has been available on Kindle, but I’m excited to announce it is now also available as a paperback. You can purchase it at my createspace estore. And this month, as a way to say thank you to my readers, you can get it for $2.00 off. Just use the discount code WUH5CLJ4 when you check out. There is a preview available if you want to read a chapter before you buy. Within the next week the book will also be available through Amazon. Just keep in mind that the discount code only works at the estore. In these days Facebook likes, reader ratings, and comments are helpful. So if you enjoy the book (or enjoyed the Kindle version) I hope you will take that little extra step. If you would like to buy 10 or more copies as gifts email me at wally@thedaysman.com. There will be a couple of more titles available before the end of the year, all compilations from thedaysman: A Married Man: essays on sacrifice and celebration and It’s a jungle out there: Faith, hope and your resume. Isn’t it nice to know your Christmas shopping will be this easy? And be sure to look for my post later this week about bragging. I’ve written before about the tension of self-promotion, and I’ve been thinking about an article on bragging in the Wall Street last Tuesday. Life is not without irony. And of course there is a retrospective coming next Wednesday. Thedaysman is 10 years old.